Engage the dog for 10 seconds without formal cues, proceed to pivot platform, pause in heel position, and execute 180-degree pivot. Purpose: Demonstrate control even when interacting with the dog in an informal situation. 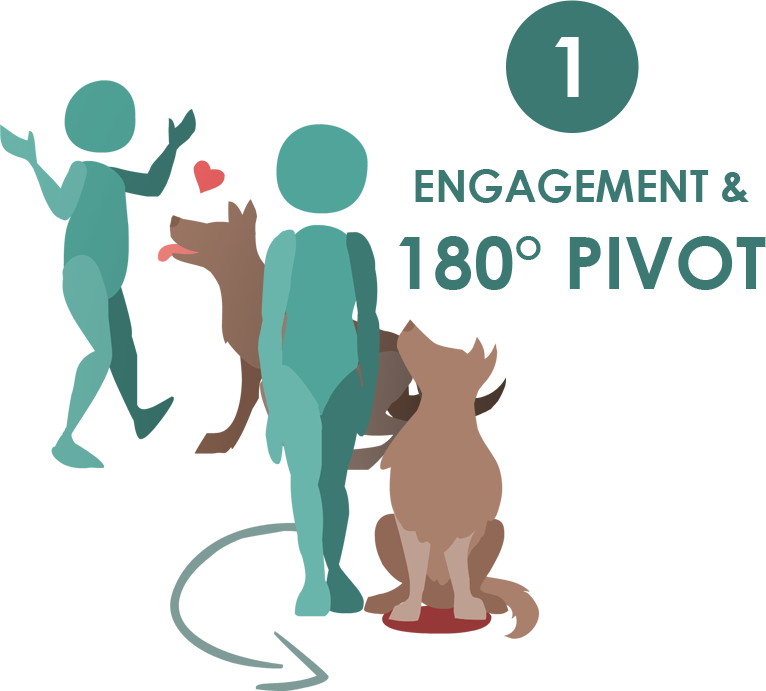 Exercise set-up: The exercise begins when the handler starts to engage the dog using personal interaction, without the use of visible food or toy. The handler may run with the dog, pet and cuddle the dog, playfully grab the dog’s feet, or show anything that involves personal interaction with the dog for 10 seconds. Tricks such as spins, hand touches, etc. are allowed, if desired. During this time, the dog’s attention should be on the owner. The dog does NOT have to continuously face the handler as long as he/she continues to engage even when facing away (for example, the dog runs a small, happy circle and then returns for more engagement). After completing engagement, the handler then proceeds directly into the pivoting portion, using a front foot target/pivot platform. The second part of the exercise begins when the handler cues heeling and begins to move slowly counterclockwise 180 degrees around the foot target. The exercise ends when the dog finishes the full 180-degree pivot. Non-qualifiers: Dog leaves the handler or is actively disinterested in the handler during the 10 seconds. Dog appears distressed by the interaction. Handler unable to get the dog to engage. Handler uses formal cues to make the dog stay close, such as cuing the dog to “heel” or “stay.” Handler uses a visible toy or food to aid the interaction. Dog does not show an understanding of pivoting in a counterclockwise position as the handler moves. Dog’s body does not remain parallel to the handler. Dog requires multiple cues to pivot on the platform. Handler does not maintain a normal, upright position. Handler uses shoulders to “pull” dog back, rather than moving feet around the platform. Handler does not complete a full 180-degree pivot. Video does not permit the exercise to be adequately judged. Tips: (1) Handler may opt to keep pivot platform out of testing area and place it when that portion of the exercise begins. (2) Engagement can be simply gentle play or whatever works best for your dog – movement is not required; we just need to see a 10-second stretch. Completed exercise – Note that 360-degree pivot was done but only 180 degrees required.